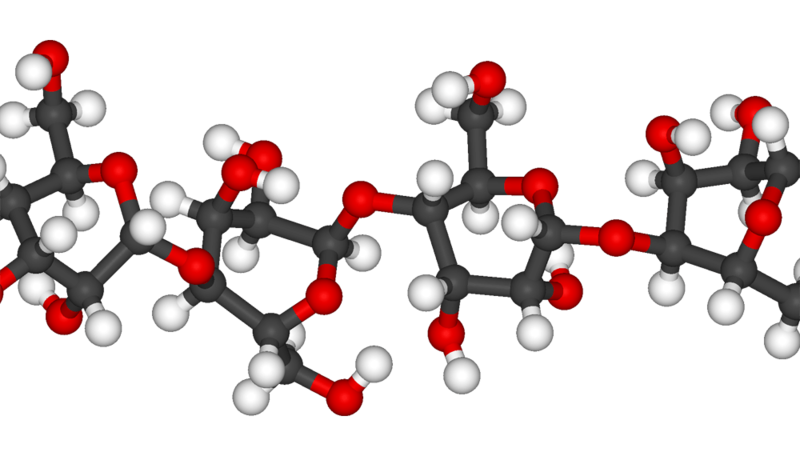 Cellulose is a polymer that exists in the form of chains made up of many glucose monomers. The many polar hydroxy groups that exist along cellulose chains form hydrogen bonds with those on adjacent chains. The bonding causes bundling of cellulose chains which results in the great length and strength of cellulose fibres. The reduced availability of hydroxy groups due to their involvement in hydrogen bonding makes cellulose insoluble and reasonably resistant to chemical attack. Cellulose is a biopolymer, and forms the main structural component of plant cell walls. Normal dry plant matter (which forms a large proportion of the earth’s biomass) consists of about 50% cellulose, and plants on earth produce approximately 500 billion tonnes of the substance each year.